It’s time for the first of 2010’s GeekTonic Media Gadget Showcase Series. 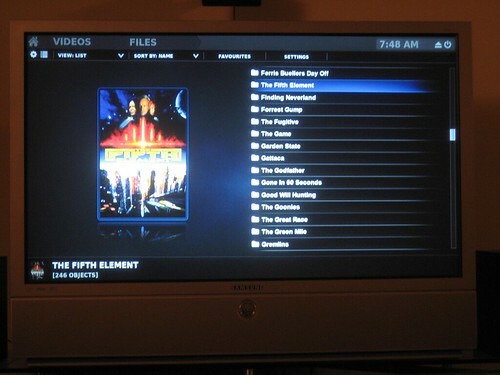 Today Rothgar shares with us his experience with HTPCs – in particular his current MythTV HTPC setup. NOTE: This is a guest post by Rothgar. To read more about how to submit your photos and/or write-ups for the GeekTonic Media Gadget Showcase Series, read this. Basic guidelines for writing and submitting a guest post at GeekTonic can be found here. Let me start with the specs of my media setup. 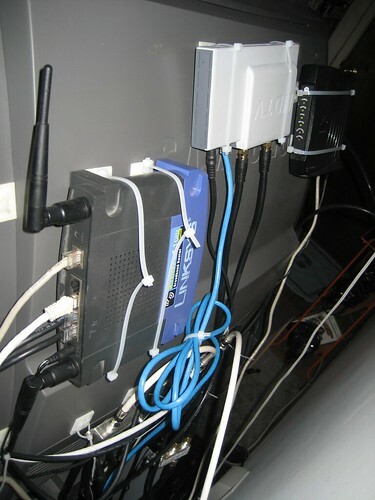 This is what the system originally looked like in 2005. I know it isn't much but I started piecing this together while a senior in college on a limited budget. 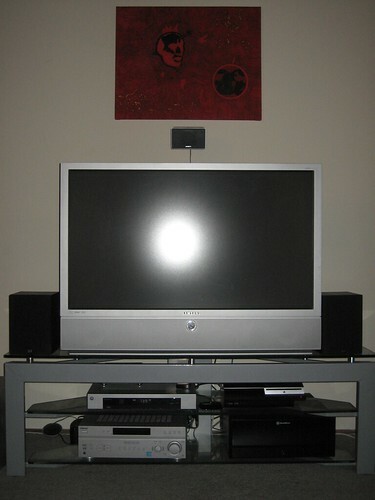 I bought the TV and receiver in 2005 with left over student loan money. My wife agreed that I could have $2,000 to buy everything needed for our home entertainment. At the time that included the TV, receiver, NTSC set top box, speakers, TV stand, speaker stands, and any other misc stuff I needed for the setup. That is not a lot of money, especially for 2005 when HDTV was still really new, but using eBay and some fancy sales I got everything I needed, even was a little under budget. My original plans was just for OTA HD but in just a few years I have gone way beyond that. My HTPC path has included many different machines and I’ve tried a lot of software suites (both Windows and Linux). Most of my previous HTPC's were built using free/retired computers from work which meant they were always kinda slow. 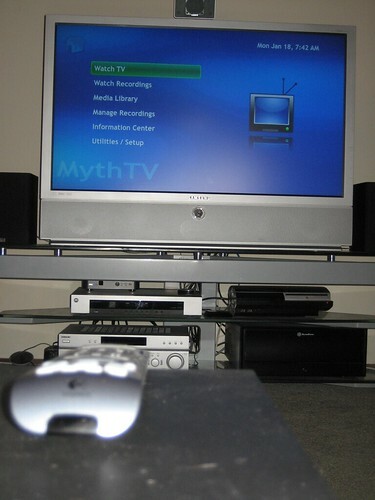 I started using MythTV back in 2006 and keep coming back because of the cost (free), hardware support, and features. You can see some of my HTPC history here as well as a couple other blog posts. Currently the system looks a little bit different and looks like the picture below. Operating System: Mythbuntu 9.10 x64, Windows 7 Ultimate x64 (but I have only booted into it once). The whole HTPC probably cost me about $900-1000 including tuners which has made this build really more of a budget build than anything. Most of the items came from selling/trading things or gifts for Christmas or birthdays. Currently my HTPC is plugged directly into my TV using DVI with my HDHomerun and HD-PVR plugged directly in with ethernet and USB. 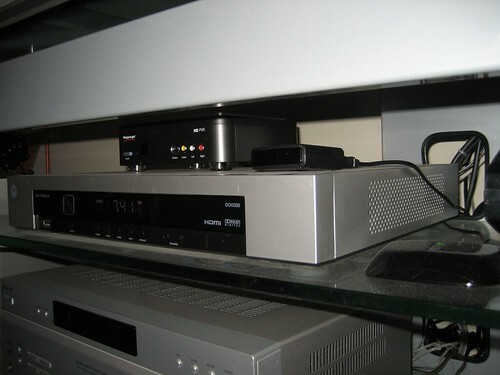 The HD-PVR is plugged into a Motorola DCT3200 cable box and channel changes are done via firewire and the Mythchanger software. Recorded TV is stored on my 250 Gb hard drive and archived TV and other media is stored on my HP MediaSmart server. The MediaSmart server is mapped to ~/Music, ~/Pictures, ~/TV, ~/Movies, and ~/Videos which allows me to easily access any of the stored media. As for software, I am using the standard MythTV 0.22-fixes frontend installed with Mythbuntu 9.10 because it was the easiest and fastest way to get up and running. When the main TV is being used I also use my laptop as a remote frontend which allows me to watch live TV and recordings anywhere I have wireless access. I plan on moving over to MythBox once XBMC 9.11 officially comes out. I also hope to switch between XBMC and Boxee/Hulu Desktop just for more features if I ever decide I want them. Or there are a couple of plugins in development that might make these programs unnecessary. Right now the setup is great. Commercial flagging was as simple as checking a box, and adding and managing 5 tuners is much easier than I expected it to be. I look forward to the next release of MythTV 0.23 in Q1 2010 and hope that Nvidia continues to improve their VDPAU drivers. Right now I will just continue supporting the best open source media center software and look forward to new releases. Follow my how-to's and reviews on my blog, my daily adventures on Twitter, or my Linux talks on the mintCast podcast I co-host. About the Author: Rothgar first got into media gadgets with the KISS DP-600 DVD player which could stream DivX from a file server. From then on I was hooked on media gadgets and all things home theater. I really got into Xbox hacking with Xbox Media Player (now known as XBMC) and have modded more Xbox's than I can count. As the hardware started to show it's age, and the growing desire to be able to record live TV I made the natural jump to HTPC's. I started with MythTV, GotAllMedia, Media Portal, XP WMC, and tons of other software. I always stayed on the free side of things because I was putting myself through college and dirt poor. Hardware specs were also very important to me because I always was building systems on second hand hardware. While I am now out of college, and currently working full time for the university I graduated from, I still like to keep my expenses modest and almost every HTPC and tuner I have used has been a gift or from selling a previous HTPC system. The cost to feature ratio has always kept me coming back to MythTV (the hardware requirements and flexibility help) and that has opened up a whole new world of computing. I currently co-host the official Linux Mint podcast and frequently talk about Linux and HTPC's on my blog, twitter, and youtube.